The course is designed to attract students who have completed a Level 4 or Level 5 award in Transactional Analysis training and who wish to build on existing knowledge and understanding and thus enhance practice. Those who have a Level 4 award will need to show evidence of ongoing CPD and maybe asked to do two additional modules. The course aims to establish a learning environment for personal and professional development and to provide a safe environment in which students are able to share vulnerabilities and concerns and learn and develop from each other. The course will build upon and enhance knowledge, skills and theory underpinning the core philosophy and encourage students to develop their capacity for reflexivity and become a reflexive practitioner. Students will be encouraged to further integrate learning and practice and to commit to ongoing personal and professional development, allowing them to make informed decisions and to evaluate their practice in terms of its effectiveness. Our aim is to offer a flexible approach to learning. Our degrees are classified as full time so that you can draw down a student loan. We use a 'blended approach to learning' where students are supported through a mixture of formal lectures, seminars, online materials and one to one tutorial support. Lecture and reading materials will be placed on the Moodle and each subject will have a discussion forum where you will be able to ask questions if you want to clarify an aspect of an assignment etc. Do I need any previous knowledge or entry criteria? 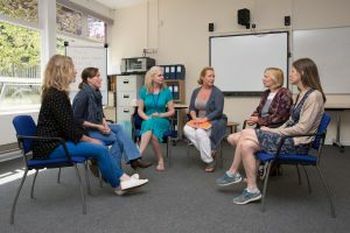 Applicants for this course should either a Level 4 Diploma in Humanistic Counselling based on Transactional Analysis and evidence of ongoing CPD, or a Level 5 Foundation Degree (or equivalent) in Humanistic Counselling based on Transactional Analysis and evidence of ongoing professional development. All students will require a grade C or above in GCSE English (or equivalent). How much time should I spend on home study? In addition to the hours at college, you will be expected to ensure that time is set aside for: 1:1 counselling (approximately equivalent to one day per week), preparation for supervision, supervision and personal therapy, reading and research and maintaining a personal reflexive learning journal. In total, this could be the equivalent of two days a week. The course will provide the student with a good basis from which to obtain individual BACP accreditation. The successful student would also be able to access the Masters Level courses in psychotherapy delivered by Peter Symonds Adult and Higher Education and potentially go on to achieve Certified Transactional Analysis status. The BA (Hons) in Humanistic and Integrative Counselling is a one year top-up course at Level 6, to enhance your counselling qualification to degree standard. It is designed for those students who have successfully completed a Level 5 Foundation Degree or Diploma in Counselling. The fee for this course for entry in 2019 is from £5,300. Any queries regarding this course should be directed to the Head of Counselling, Karen Hough, on khough@psc.ac.uk.